Few issues throughout church history have been as widely debated as that of baptism. Shortly after the time of the apostles, various and conflicting views began to arise concerning the purpose and methods of baptism. Even today, many churches hold different views on this important subject. Some hold that baptism is a necessary part of salvation while others say baptism is a testimony that one has been saved. Some churches practice sprinkling while others emphasize immersion. Some churches baptize infants while others only baptize adult believers. With all the confusion on this issue one may ask, "Who is right and how do we know? "The lack of clarity on this issue should drive us to the Bible for the answers to these issues. 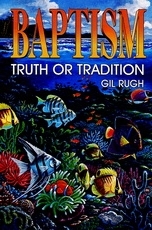 Accepting the Bible as the authority and not church tradition, Pastor Gil Rugh in "Baptism: Truth or Tradition," systematically shows what the Word of God has to say about baptism—what it is and what its purpose is. Pastor Rugh shows that the Bible is clear on the issue of baptism and that confusion on this topic has come primarily when men’s ideas have been added to the Word of God.